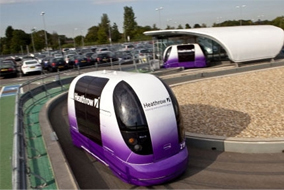 The unique pod system at Heathrow airport has confirmed that they have carried over 500,000 passengers. The pods which carry passengers from mid-stay business car park to terminal 5 without a driver has been in operation for around 18 months and has proven to be successful with lots of people taken advantage of the pods. Norman Baker, UK Transport Minister said: “It will be great to see this revolutionary technology first hand and celebrate the positive impact it has had on reducing congestion at Heathrow over the past 18 months. If you are flying via Heathrow Airport be sure to use our Heathrow airport cab service.